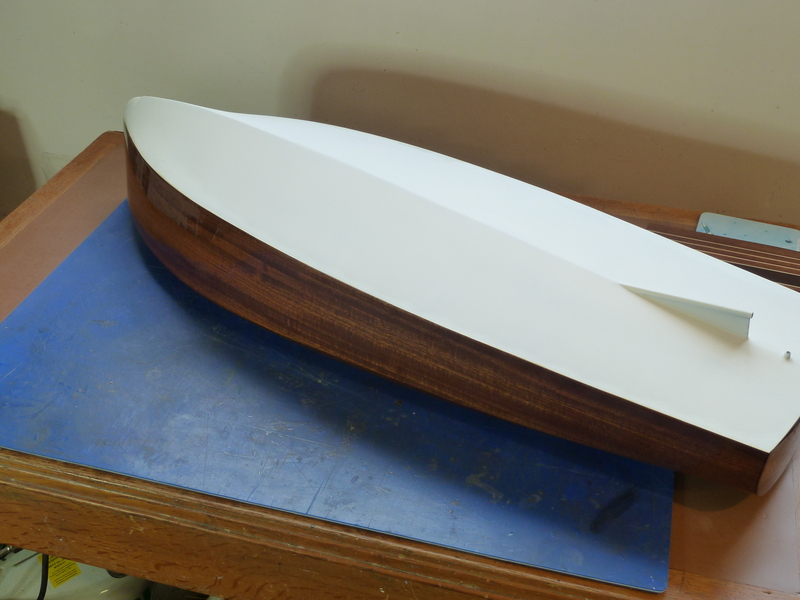 Having shelved the Chris Craft build for the time being until I can locate some acceptable fittings, or am well enough to make my own, I decided to move on to another boat build. The model chosen was another 1/8th scale model. This time of a 1922 Gold Cup race boat derived design called Miss Severn. The kit is produced by Mack Products, and mine included the add-on lighting set. As the model will be built for static display, none of the radio control elements will be fitted. A fair amount of work has gone on since the last post on this build, though there isn’t a huge amount to describe. Well it’s been longer than I anticipated since my last post, but due to not feeling too good, and the modelling room being too cold, I have only recently got back to making models. 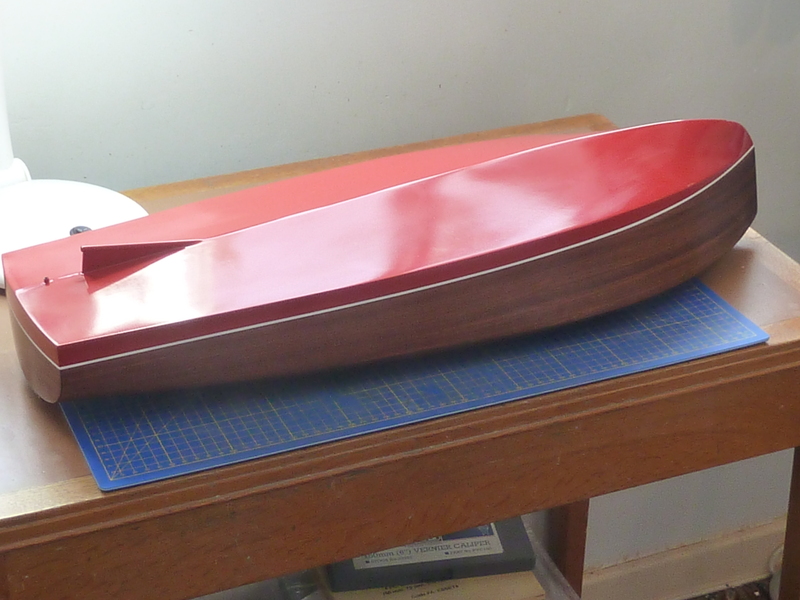 After the sanding of the hull on the Barrel Back I moved on to the varnishing which has been a comedy of errors, mainly due to my lack of experience with some of the materials I suspect. 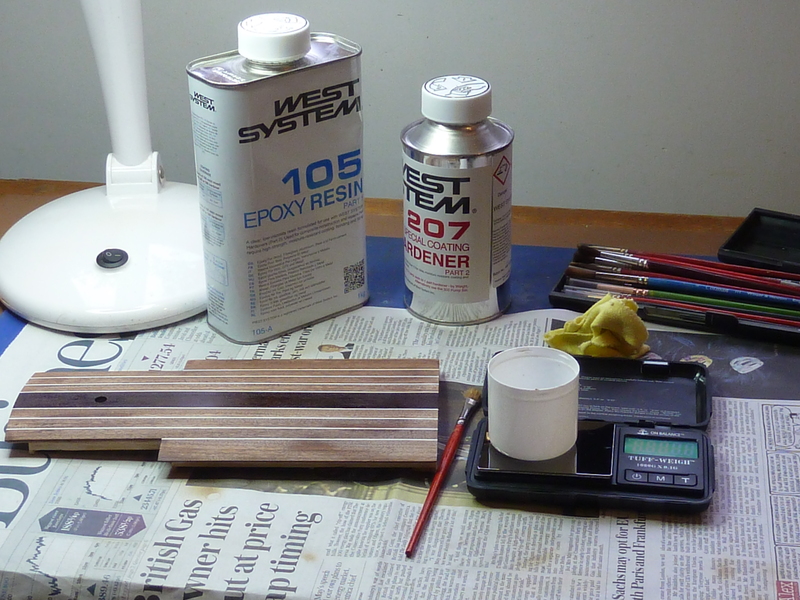 I’ve never used epoxy resin as varnish before so it was all new to me. 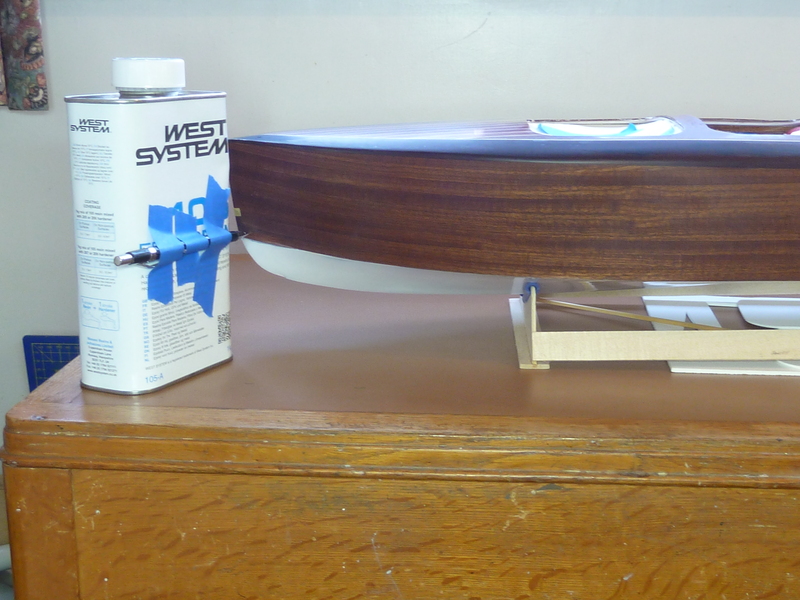 There were a number of recommendations for West Systems’ 105 formula on the model boat building websites so that what I went for. I applied it with a brush and the initial coat went very well. The second coat however suffered horrendously from ‘fisheyes’. 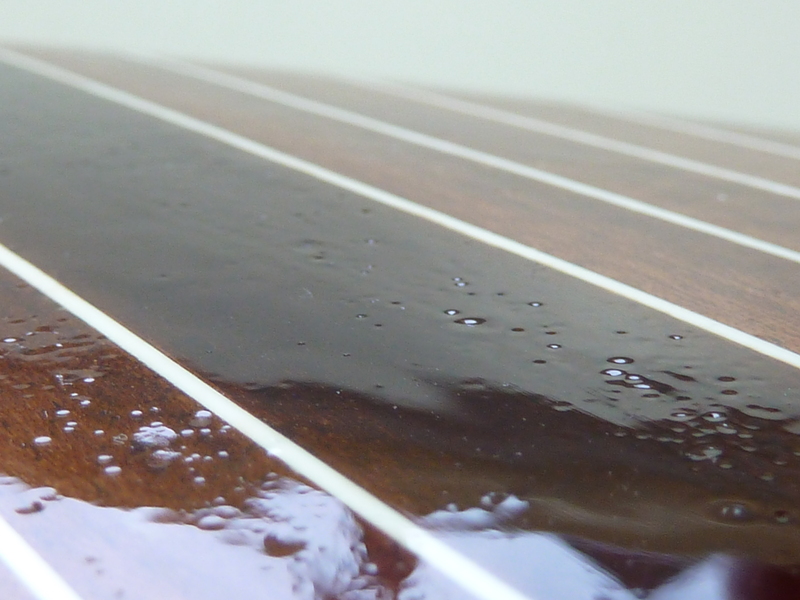 Dimples in the surface caused by the resin being repelled from it. 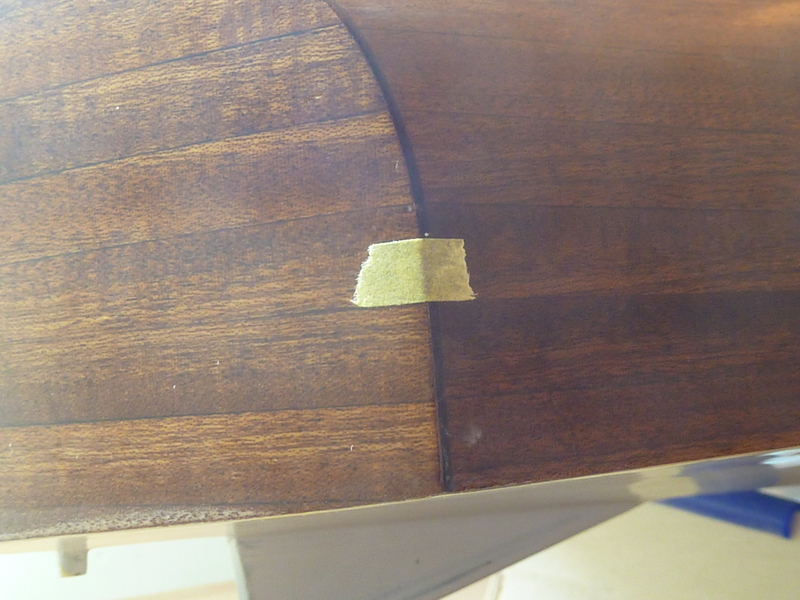 You can see the result in the picture below where I have commenced sanding the surface back to recover the situation. I think left too much time between the coats of epoxy and the first coat wasn’t tacky enough for the second to take properly. Whatever the cause, the model was a mess and naughty words were said. Then began the task of recovering the model. 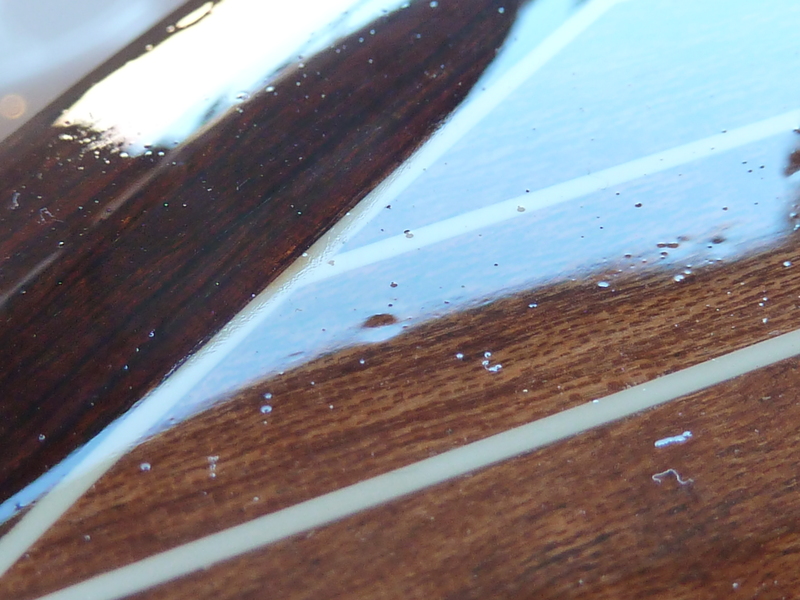 Rather than persist with the epoxy and dig a deeper hole I elected to return to a good old polyurethane varnish. Ronseal’s Yacht Varnish to be exact. 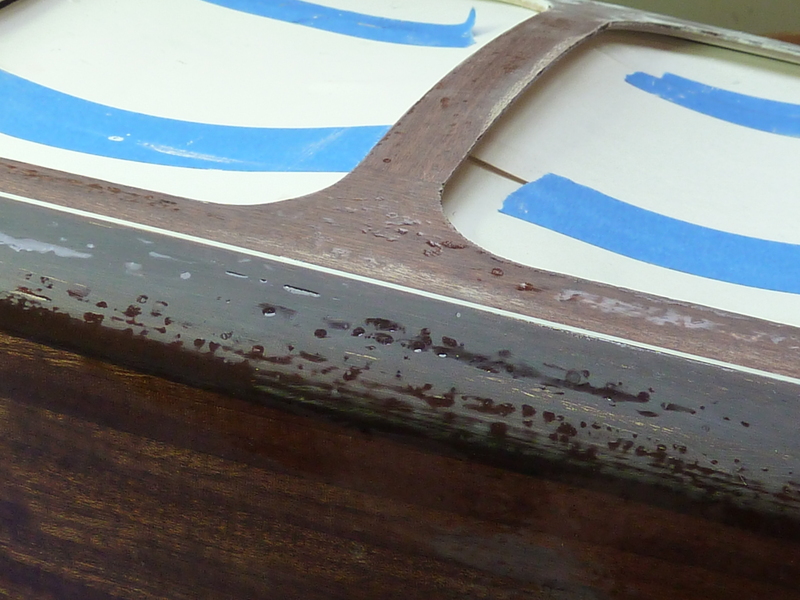 I put on a number of thick coats and sanded each back until all of the fisheyes were filled. This was not a quick process. At all. In fact it took a number of weeks. However, after a lot of effort and sanding I got the model back to a reasonable standard. 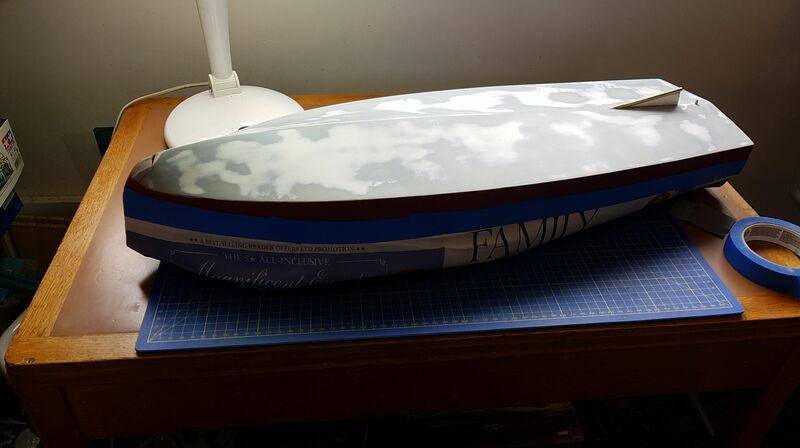 Prior to painting and the final varnishing of the kit I decided to glassfibre the bottom of the hull. 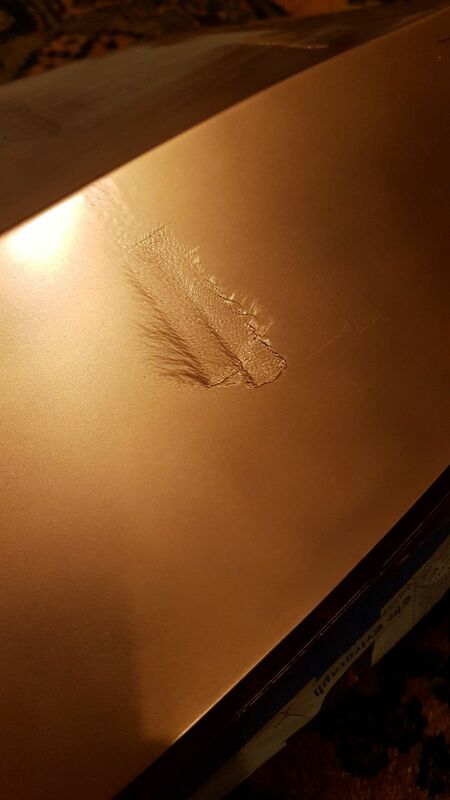 The PVC sheet used is quite soft and during the assembly process a number of dents and dings had appeared in it. I could see the same happening during the model’s life so decided to provide some additional protection to it. 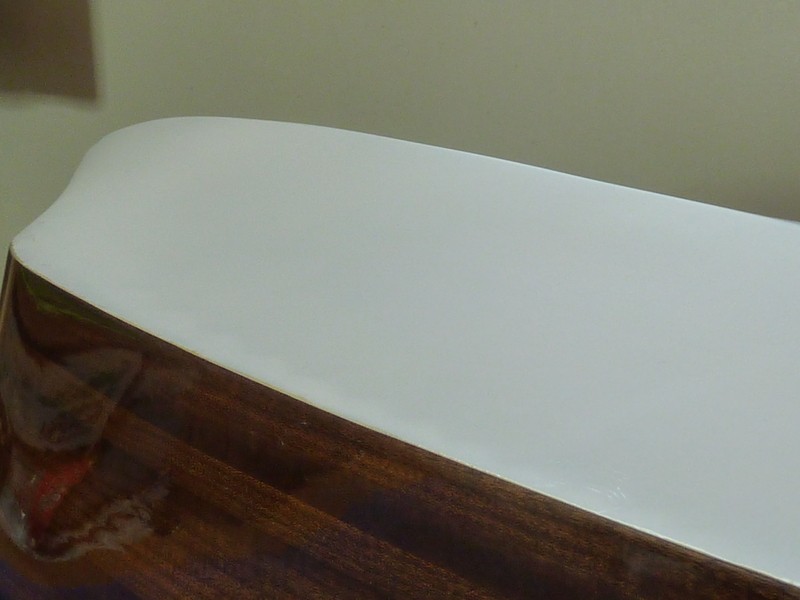 The glassing process was pretty straight forward and went well. 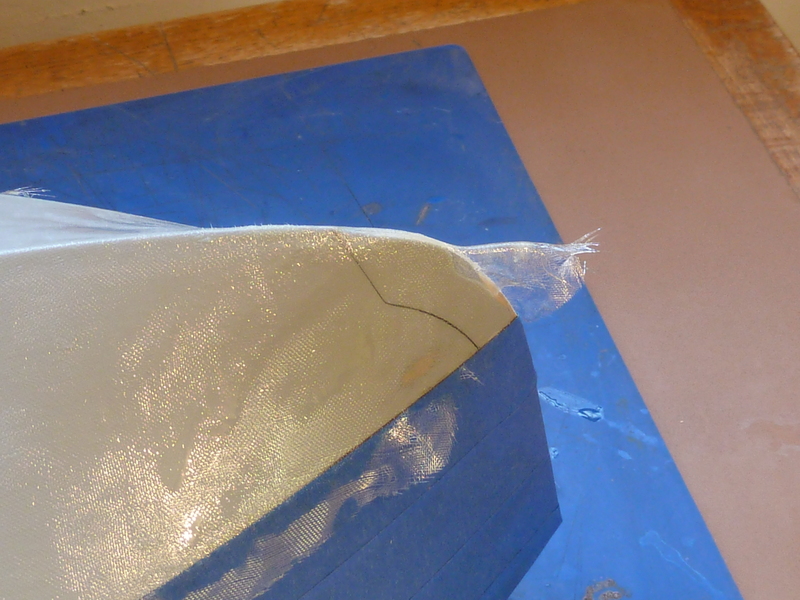 As I was using 25g (1 oz) cloth it was even easy to follow the compound curves at the bow. 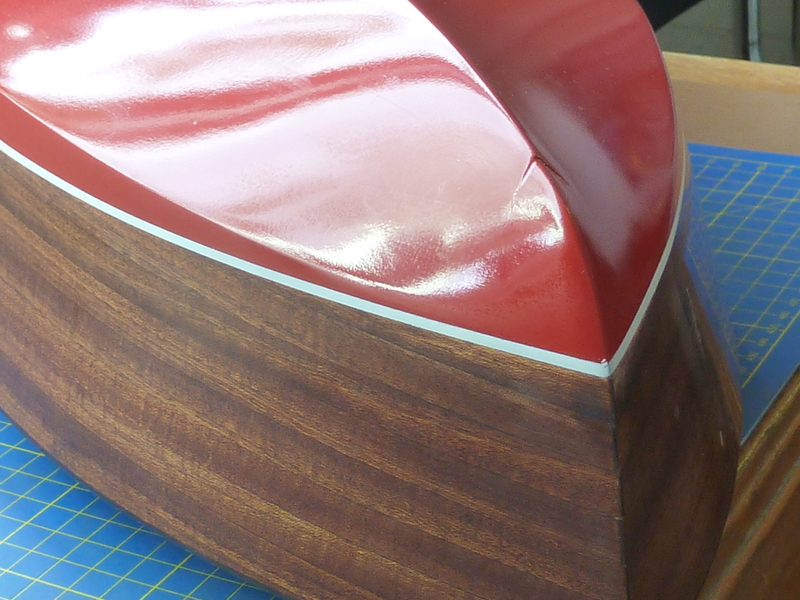 Another coat of epoxy and then some high fill primer left me with a nice smooth surface for the paint. 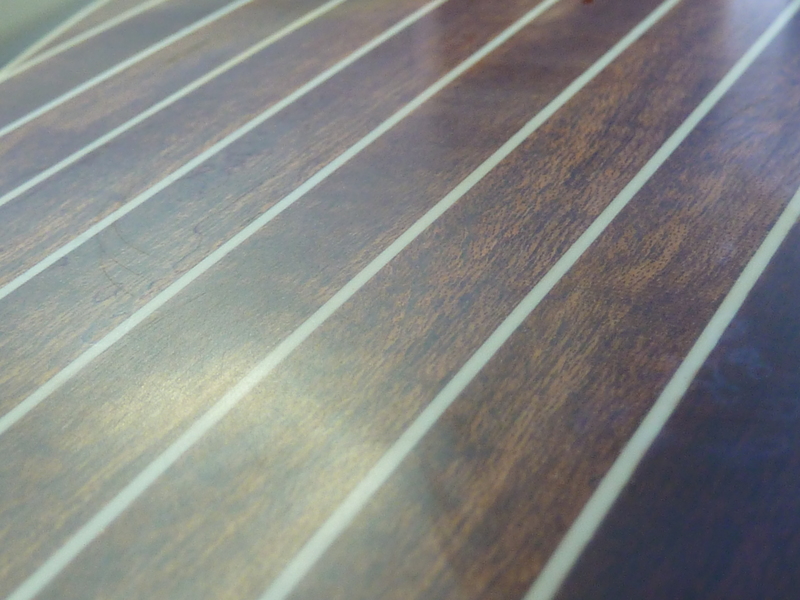 Then it was simply a case of marking fore and aft where the water line should be as defined in the Dumas drawings, jigging the model up on a flat surface so the marks were equidistant from it, and then using a pen taped to the epoxy bottle to draw the line between the marked bow and stern points. The marker on each side of the stern. Do they use the term ‘Plimsoll Line’ on boats of this size or is that just the big jobs? 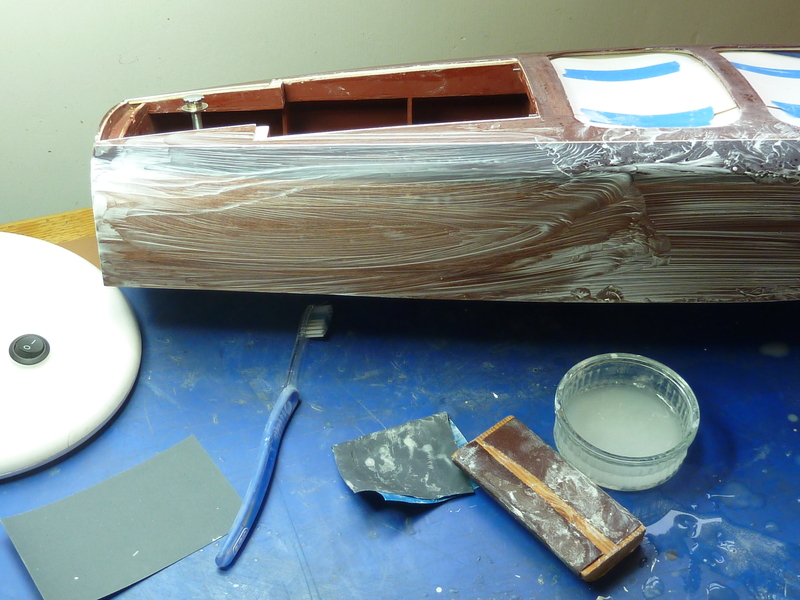 I then airbrushed the lower hull with a dedicated primer and several coats of a nice copper paint that I have and it did look smashing. However, the stuff was quite slow to dry and soft too. In fact I ended up putting the model next to the radiator for 3 weeks to try and harden the stuff off, but it was having none of it. Even after 3 weeks of baking, the paint just refused to harden, and when I left the model in its cradle overnight I was greeted with this the following in the morning. Notice how nice the finish is either side of the mark though! Again, bad words were said and I must confess the model put on the shelf for a month or so as after the epoxy debacle and now this I couldn’t face working on it for a while. Eventually I took a deep breath and commenced the filthy task of sanding all the copper coat off and getting the model back to the primer stage again. I did consider having a second go with a different type of copper paint, but bailed out in the end and went with an ordinary red instead. The paint finish just awaits the final overall clear gloss top coat now, but before I add that I need to apply the decals. The ones in the kit are printed on clear vinyl which is a bit too thick for me. I think it’ll be tough to hide them seamlessly behind the final top coats, so I’ll have to have a look at the costs of getting some custom ones made. I’ll also do some trials with the kit ones to see if they are easier to cover than I anticipate. 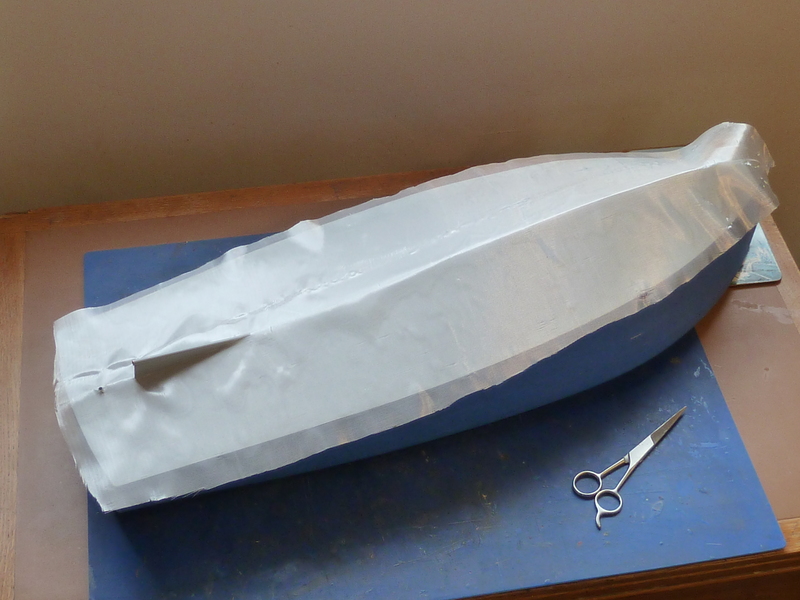 In the interim I have been making some of the fittings for the boat including the cutwater, rear fenders and exhaust. 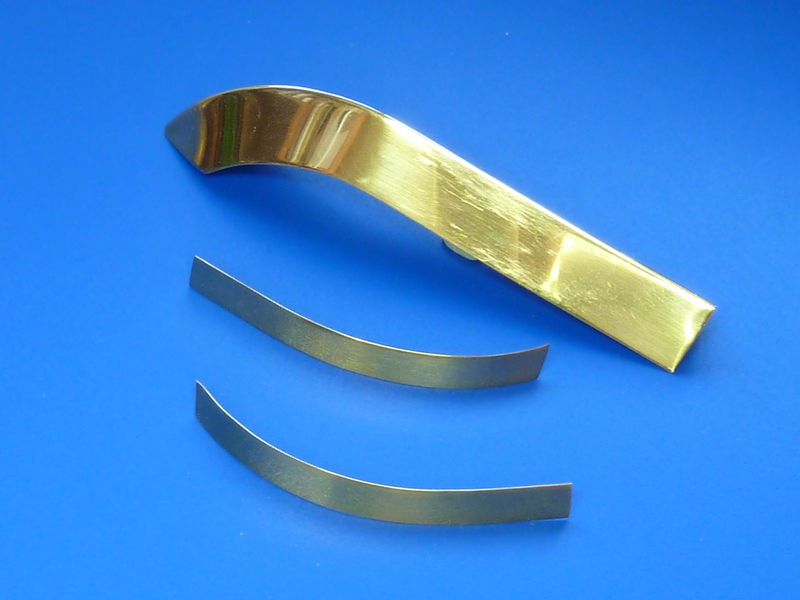 These were made from brass sheet and tube I had to hand. They will need plating before fitting. 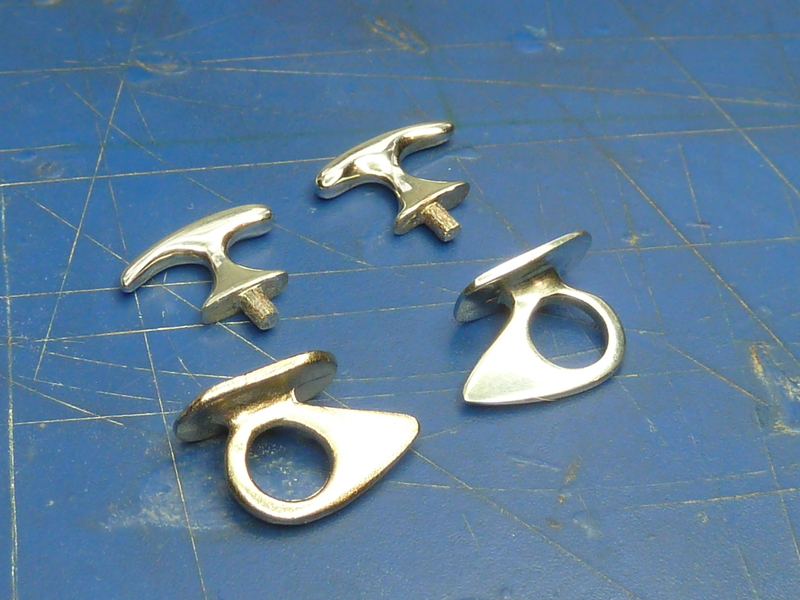 I’ve also been struggling with Dumas’ fittings provided with the kit. 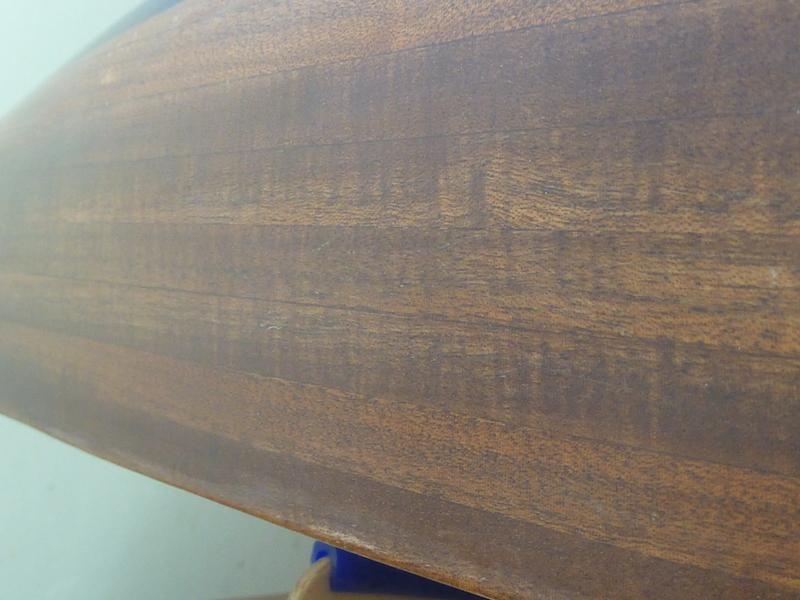 As I may have mentioned before, they aren’t really up to the standard I want and polishing them up to a reasonable finish is a long and arduous process when no power tools are involved. 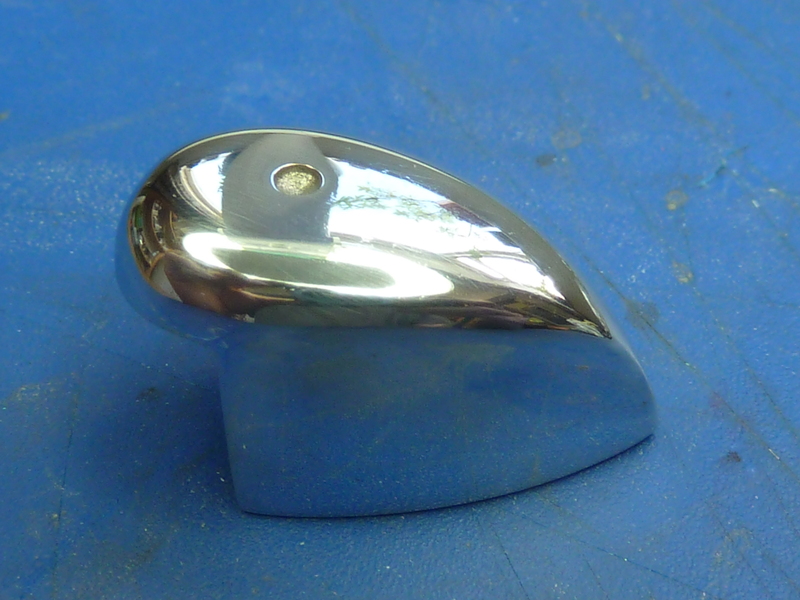 Dumas have plated the castings before they were polished, which means removing all of that too. 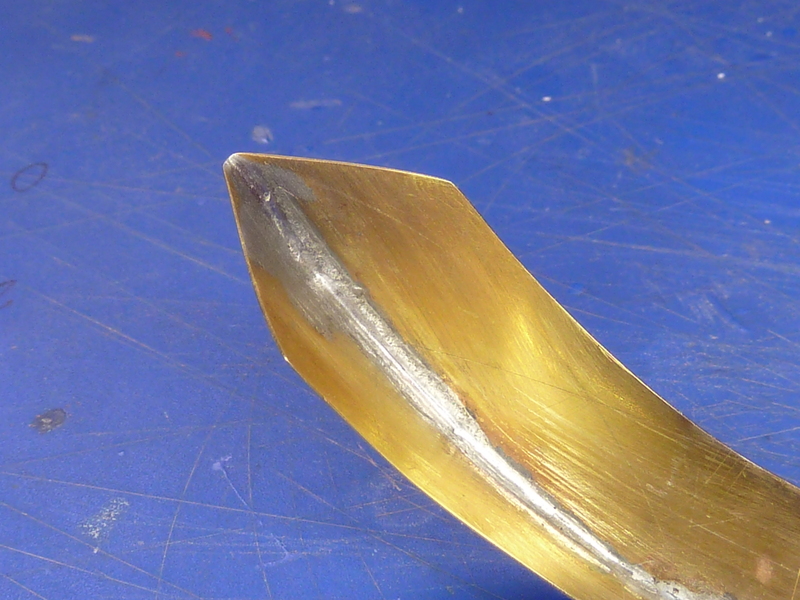 I understand that Dumas will provide unplated castings, on an exchange basis, if you ask them though. 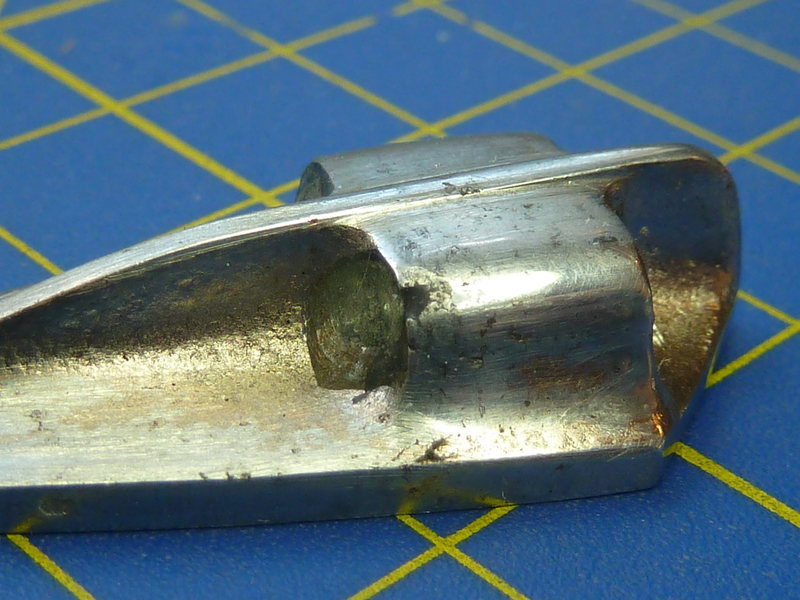 One casting that I have really struggled with is the bow mooring point. 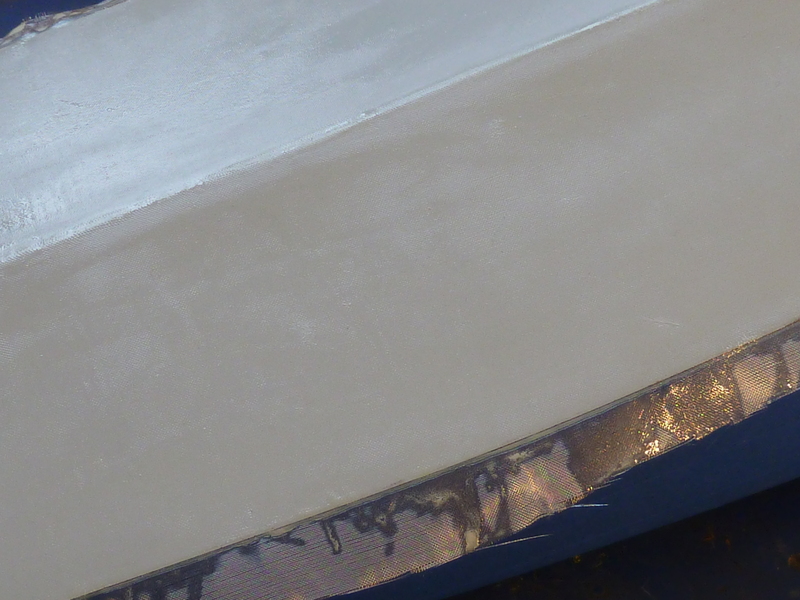 I tried for quite some time to improve and polish what was offered, but during the process discovered some inclusions of slag in the casting that no amount of tinkering was going to fix. 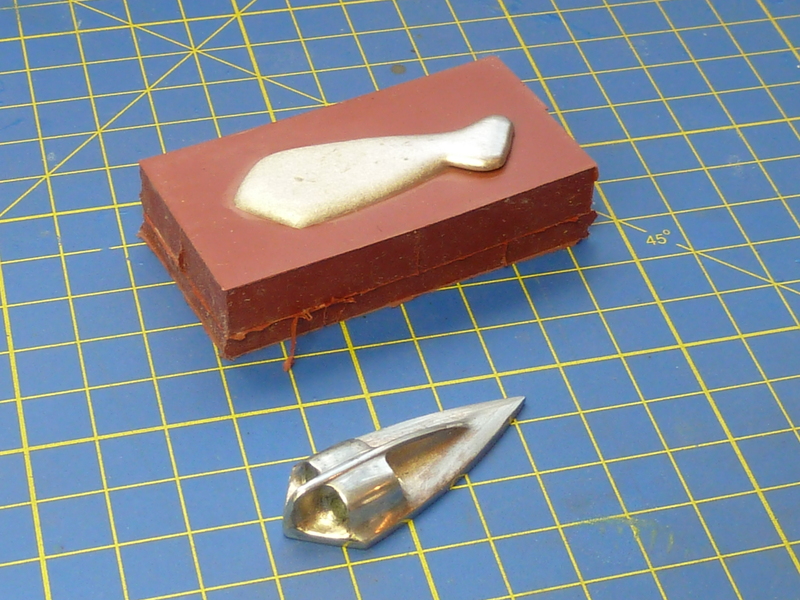 So in the end I used the Dumas part to create a mould in RTV-101 rubber and then cast a replacement. You can see the inclusions in the casting in this picture. 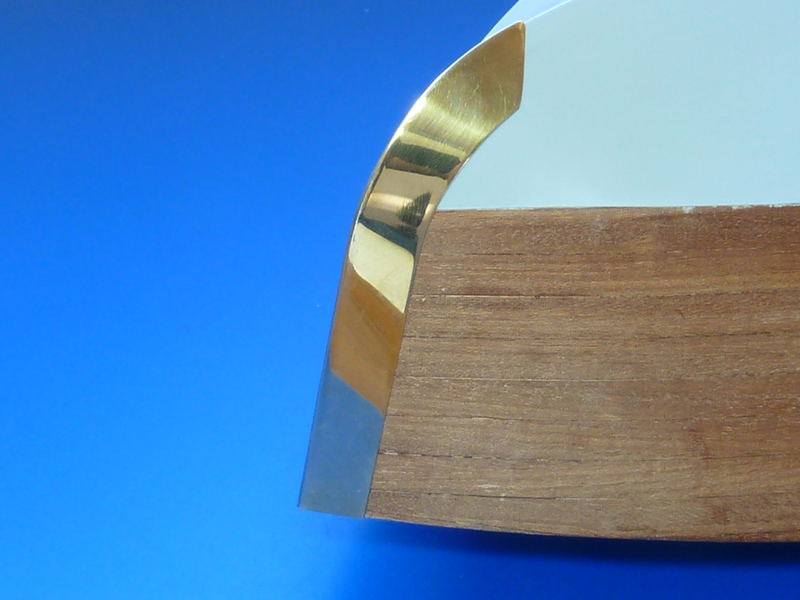 Now to drill out, file down and polish up the new item. 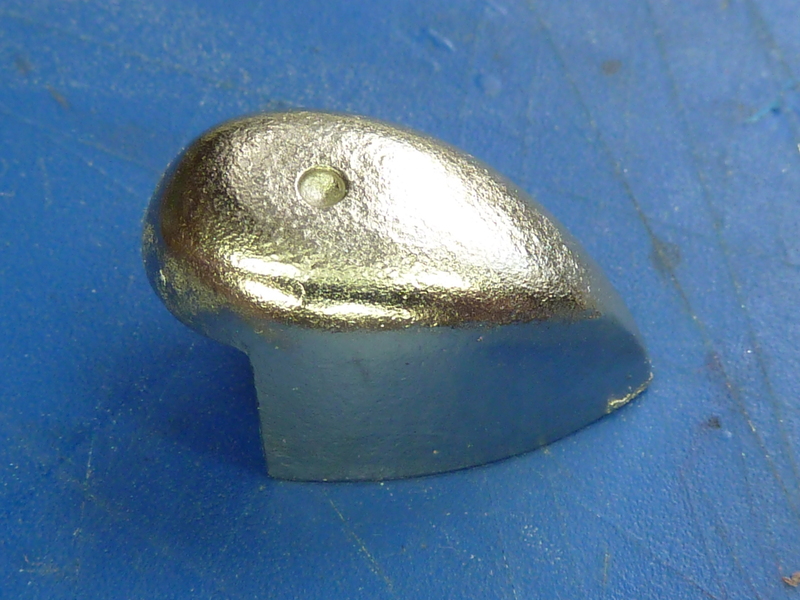 I’ve cast the new part in a lead free pewter which is usually used for jewellery as it has some added silver. 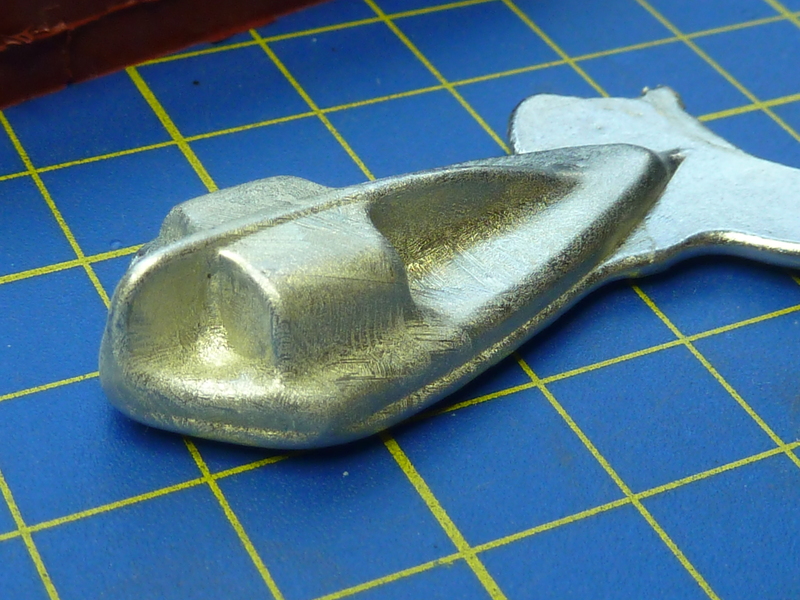 I may need to do something similar with the horn casting provided in the kit which is very poor. However, with that I may have to resort to making a new shape from scratch, which I don’t look forward to. 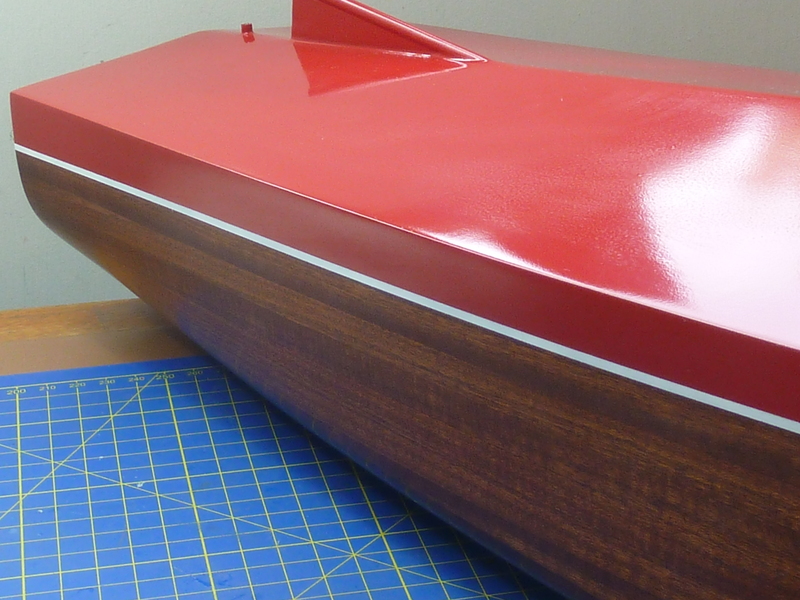 If anyone knows where I can buy high quality castings for this type of boat I’d be very grateful for the information. 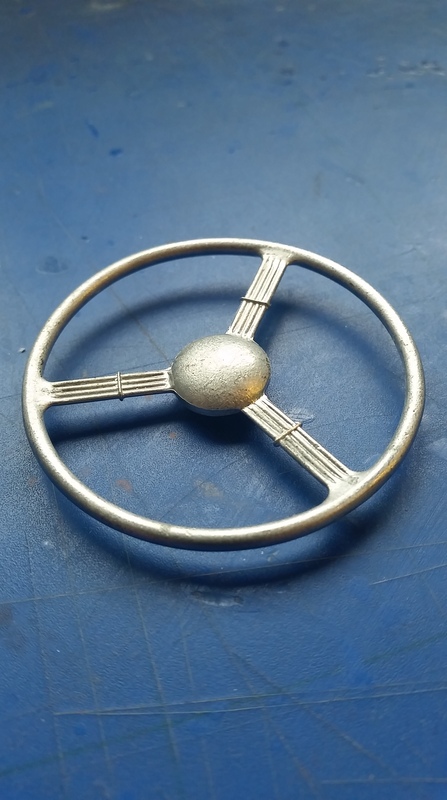 The closest I’ve found on the net is Wet Goose’s products, but they aren’t quite the right size, require plating and are also for a 1939 boat, not the 1940 one I’m building. The other item I’ve been working on is the steering wheel (helm?) Again the basic casting is a little below par. I’ve seen others on the net create wonderous items using lathes etc, but I am forced to do everything with hand tools. The basic rim and hub were OK, so I decided to just replace the spokes. 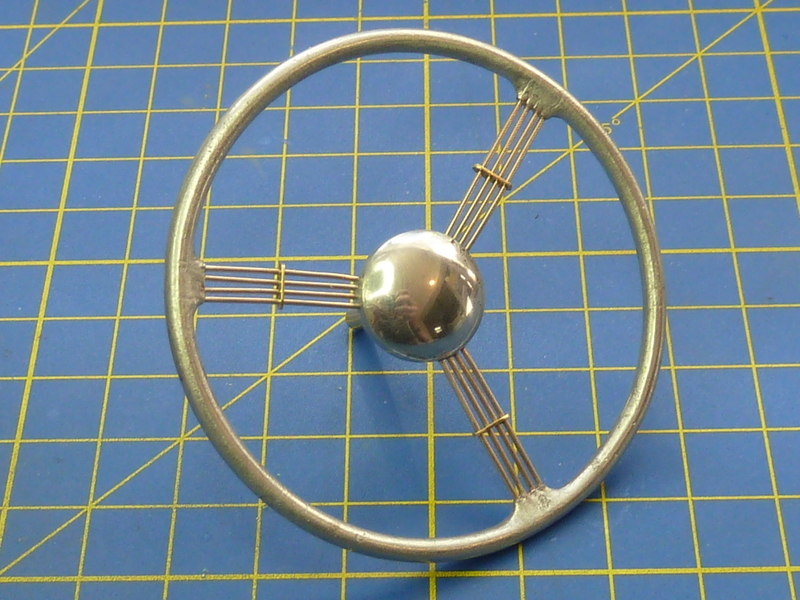 I used 0.7mm nickel-silver rod for the spokes and some brass sheet for the fences. Drilling the rim and hub accurately by hand was not the simplest task I’ve ever done and alignment of some of the holes isn’t as good as I’d have liked. 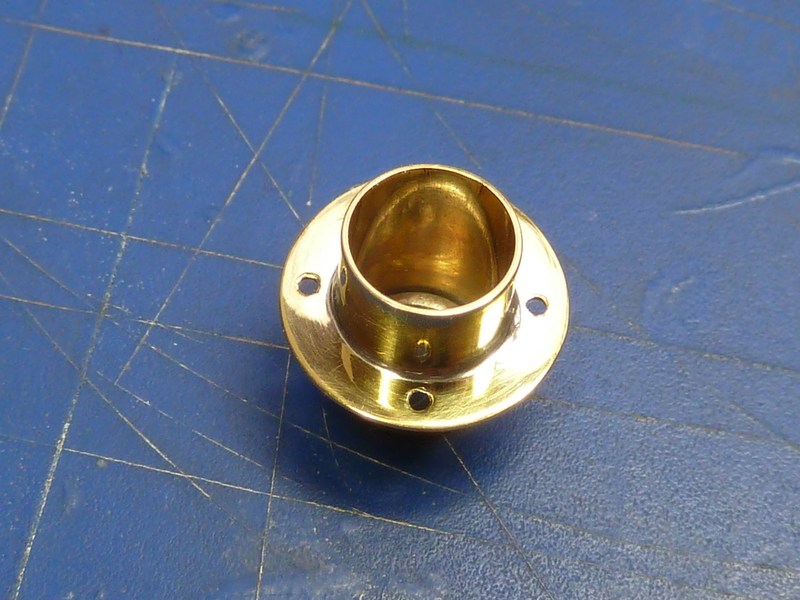 On the real item there is also a lever attachment on the face of the hub. I’ll have a think about how I’m going to add that, if at all. The improved version is definitely better than the original, but isn’t nearly as neat, even and accurate as I’d like. So that brings things up to date on the boat thread. I’m now investigating new decals and awaiting the delivery of some two-pack clear polyurethane varnish for the top coats.